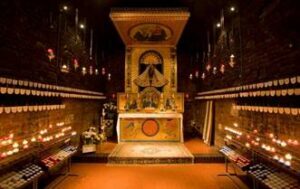 Recently a party of 9 students, accompanied by Fr Thomas CR made a weekend pilgrimage to Walsingham. Taking all the prayer requests from the board in the College Oratory to include whilst on pilgrimage, we put them alongside our own supplications at the shrine. With the other pilgrims we entered fully into the life of the Shrine and attended the Pilgrimage Mass, Shrine Prayers, Liturgy of Healing and Reconciliation with laying on of hands, Sprinkling and Benediction. It was ‘low season’ at the Shrine so we students had the whole of one of the guest blocks to ourselves. 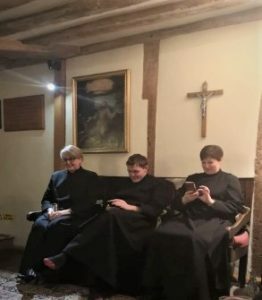 We used the spacious and comfortable upstairs living room as our Pilgrimage Common Room where we listened to the two excellent addresses given by Fr Thomas (about two anti-types of Mary, Rebekah and Hannah), and also to relax in at the end of the day. Many thanks to Fr Thomas for his prayerful leadership of our pilgrimage, to Frs Kevin and Andreas and all the team at the Shrine for making us all so welcome, and of course to our pilgrimage officers, Ben and Max, for organising our weekend of prayer, reflection, fellowship and fun so impeccably.